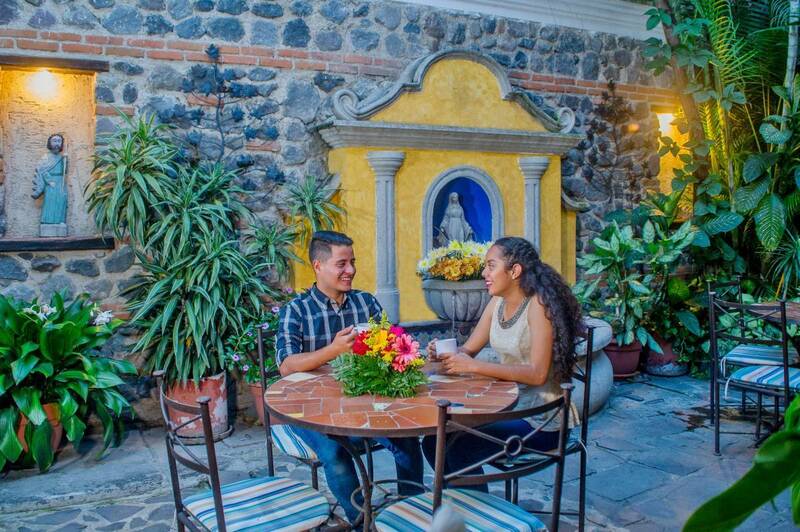 Budget hotel & midrange hostel or guest house in Antigua Guatemala, 2 blocks from Central Park, close to important sites, far enough away for a peaceful rest. Travel desk, Internet cafe, International phone calls, Kitchen, Bi-lingual staff. refused to return deposit ... I booked 5 days in Feb. I had a medical incident on the way to the airport. Arriving there, I was taken to a hospital and missed my flight. My stroke-related health problems continued and I was unable to notify the hotel about not arriving. 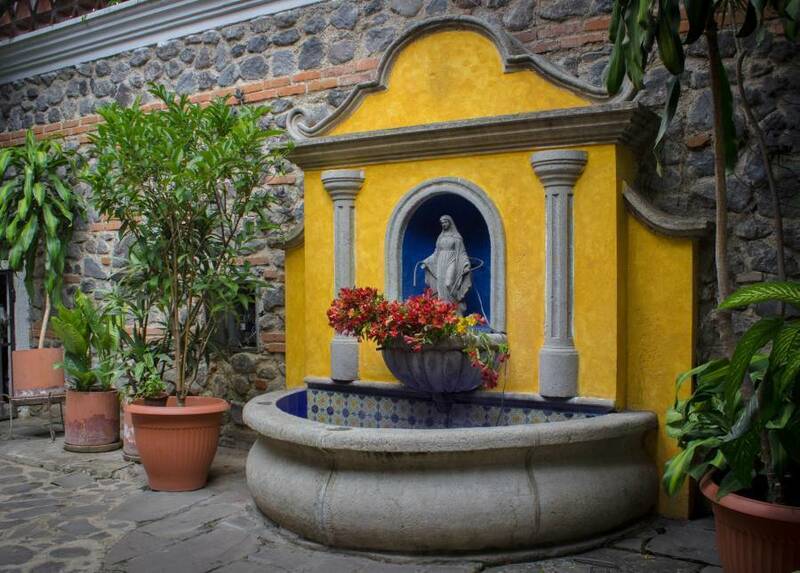 Beautiful mid-range hotel in the heart of Antigua Guatemala. We offer everything that you could need during your stay in Antigua: cable TV, internet, international phone calls, use of a fully equipped kitchen, travel desk, hot water, daily maid service, laundry service, bag storage, Spanish classes, etc. Our goal is to make your stay as comfortable as possible, whether you want to relax or you want to explore the city. Our great location, 2 blocks from the central park is close to all the important sites, but far enough away to give you a very peaceful rest. 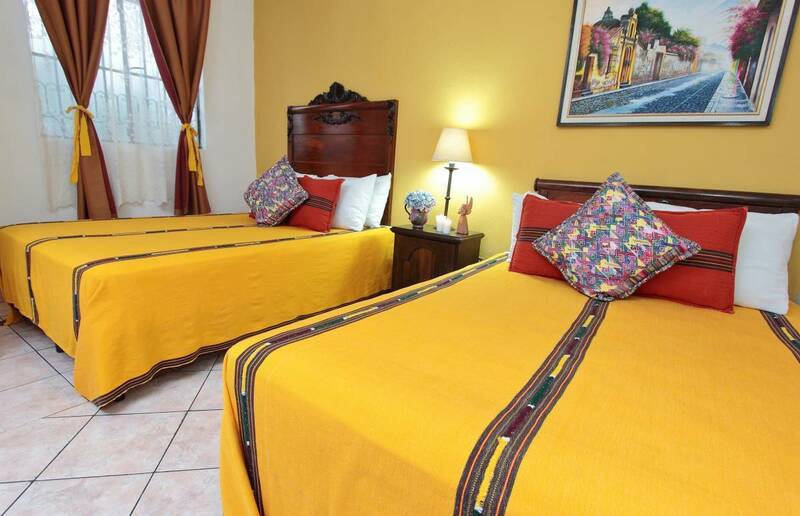 Our rooms and common areas are decorated with beautiful Guatemalan furniture & textiles. They are spacious with lots of light & bright colors. They have beautiful tile work & many nice extra touches, you would not expect in a mid-range hotel. All rooms come with private bath, cable TV, hot water, linens, towels, soap & window views. They all have furniture for hanging & folding clothes. All rooms have many hand carved wood furniture pieces including beds, tables & lamps. Some rooms have views of the volcanoes or terraces. We have 2 large terraces with great views of the city, mountains & volcanoes. All rooms are well lit with ceiling lights & beautiful hand carved lamps on the night stands. Our sitting & reading lounges are also beautifully decorated & very spacious. It is easy to keep in touch, while you are here, with our large internet cafe & international phone call service. We also offer a Travel Agency, use of a fully equipped shared kitchen, laundry service, bag storage, Spanish classes, large terraces with sitting areas, a garden with a trickling water fountain, a breakfast sitting area & a wonderful reading lounge. Our bi-lingual staff will help you with all your needs and give you good tourist info. For families with children, we provide pack-n-plays, high chairs, assorted baby toys & a baby friendly environment. Posada Don Valentino is a very tranquil hotel in the heart of Antigua. For your convenience, we offer private airport pickups for $37 (1 to 3 people), $8 per person extra. For this service, please write us an email at don. valentino@hotmail. 3 day cancellation policy: If cancelled less than 3 days (72 hours) prior to check-in or no-show, you are charged the full remaining balance of your reservation. For deposits paid to the hotel: If cancelled more than 14 days prior to check-in, you receive a full refund minus a $15 cancellation fee. If canceled less than 14 days but more than 3 days before check-in, you forfeit your deposit. The hotel accepts US dollars, Quetzales, Travelers Checks and Credit Cards. If paying with credit or debit card at the hotel, there is a 6% surcharge. 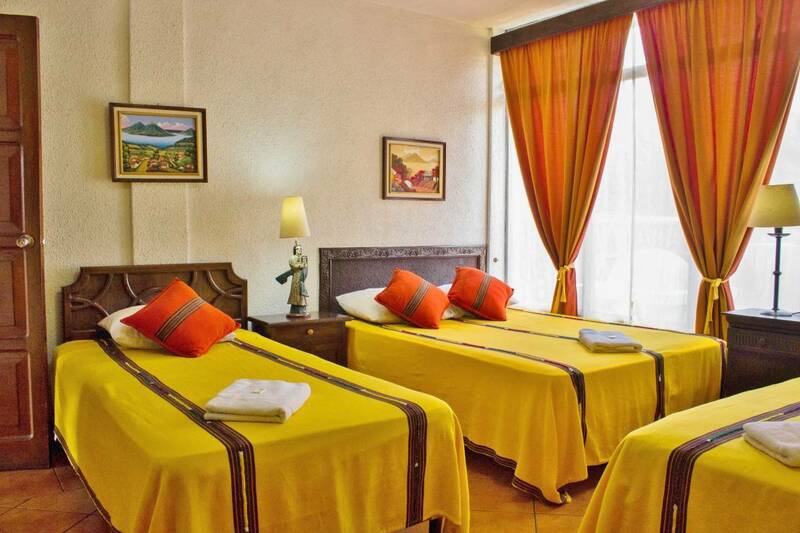 Our rooms and common areas are decorated with beautiful Guatemalan furniture & textiles. They are spacious with lots of light & bright colors. They have beautiful tile work & many nice extra touches, you would not expect in a mid-range hotel. All rooms come with private bath, cable TV, hot water, linens, towels, soap & window views. They all have furniture for hanging & folding clothes. All rooms have many hand carved wood furniture pieces including beds, tables & lamps. Some of the rooms have views of the volcanoes or terraces. All rooms are well lit with ceiling lights & beautiful hand carved lamps on the night stands. Our bi-lingual staff will help you with all your needs and answer any questions you have during your stay with us. Pet friendly, accepting your pet for $5 per night. Max. 1 pet per room. In our properties group we offer 11 hotels and 2 sets of vacation rental apartments: Three 4-star hotels (1 with suites, 1 with a swimming pool and spa, and 1 set in the colonial ruins of a historical convent), two 3. 5-star hotels, three 3-star hotels, three 2. 5-star hotels. All of our hotels are within 4 blocks of each other and within 3 blocks of Antigua's beautiful central park. We have over 225 rooms and can accommodate up to 750 people. So, we can accommodate large groups in one single hotel or very large groups between a few of our hotels. Even if your group is split between a few of our hotels, you would never be more than a 3 minute walk from the rest of your group, since our hotels are very close to each other and very centrally located to the central park of Antigua. Also, if your group is interested in meal plans, we can provide breakfast, lunch and dinner. 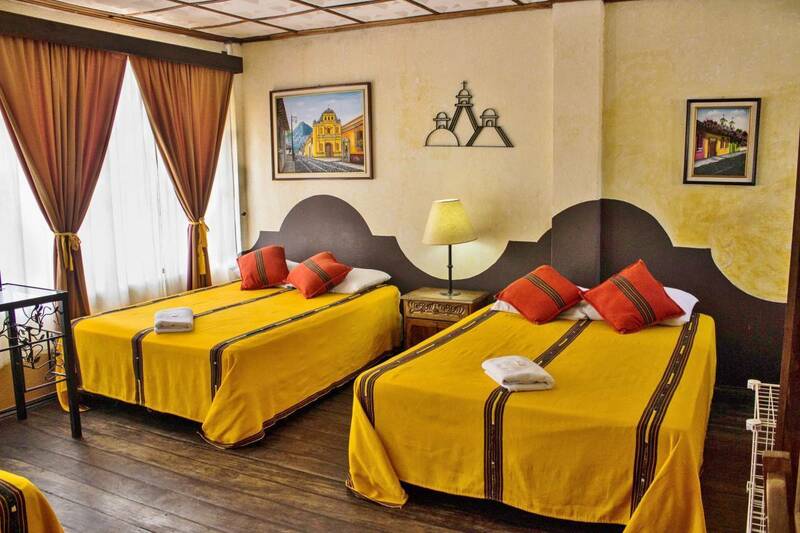 In Hotel Posada Don Valentino, we can offer single, double, triple or quad rooms with private bathrooms. We offer all private & comfortable rooms, 19 rooms in all. Our goal is to make your stay, with us, as comfortable as possible, whether you want to relax or you want to explore the city. We have 2 large terraces with great views of the city & volcanoes. Our sitting & reading lounges are spacious & beautifully decorated. It is easy to keep in touch, while you are here, with our large internet cafe & international phone call service. We also offer a travel agency, use of a fully equipped shared kitchen, laundry service, bag storage, large terraces, a garden with a trickling water fountain, a breakfast sitting area & a wonderful reading lounge. Our bi-lingual staff will help you with all your needs & give you good tourist info. We offer singles, doubles, triples & quads. All with private bath & TV. Our rooms and common areas are decorated with beautiful Guatemalan furniture & textiles. They are spacious with lots of light & bright colors. They have beautiful tile work & many nice extra touches, you would not expect in a mid-range hotel. All rooms come with private bath, cable TV, hot water, linens, towels, soap & window views. They all have furniture for hanging and folding clothes. All rooms have many hand carved wood furniture pieces including beds, tables & lamps. Some of the rooms have views of the volcanoes or terraces. All rooms are well lit with ceiling lights & beautiful hand carved lamps on the night stands. Our bi-lingual staff will help you with all your needs & answer any questions you have during your stay with us. Depending on availability: Doubles can be with 1 large bed or 2 separate beds. Triples can be with 2 larges beds or 3 separate beds. Quads can be with 2 or 3 large beds or 4 separate beds. Depending on availability, rooms can be on 1st, 2nd or 3rd floor. 3 days, If cancelled less than 3 days prior to check-in or no-show, you are charged the price of the 1st night you cancel or do not show for. For deposits paid directly to the hotel: If cancelled more than 14 days prior to check-in, you receive a full refund. If cancelled less than 14 days prior to check-in, but more than 3 days before, you forfeit your deposit, but are charged nothing more. Guests staying three or four nights will receive a complimentary Day Pass for the pool, while guests staying 5-7 nights will receive two Day Passes for the pool. The free pool pass is valid for reservations in, April, May, June, August, September and October. You may access the pool any day of the month (January, February, March, July, November and December) for an additional cost of only $5 per person per day which entitles you of the use of pool and sauna. Pool towels are provided at the hotel. The pool and sauna are located in our sister hotel, Hotel Casa del Parque, a 5 minute or a 3 block walk. The hotel is centrally located, only 2 blocks from the Central Park, a 3 minute walk, close to all the important sites. Breakfast is offered for $6 extra. This needs to be requested 1 day before. From Guatemala City airport, via Calzada Roosevelt (1 hour), enter into Antigua, go 2 blocks west of the Central Park to 5th Calle poniente #28. We offer private airport pickups for $37. This price is for 1 to 3 guest. For larger groups, it is $8/person extra. For this service, please send us an email at don. valentino@hotmail. with your arrival time, flight #, airline name & from what city you are arriving from. You can send this in a message through IWB or an email direct to the hotel.